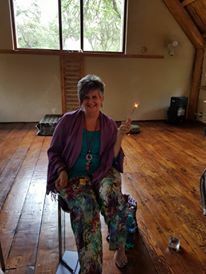 Shortly after Gate vs Di I booked to attend a mind/body/soul retreat facilitated by the fabulous Fairy Godmother Donna McCallum. I figured as it was some 5 months ahead I would be well on my way to full recovery. As the date drew nearer I became more anxious. I wouldn’t be able to walk far, do yoga or lie on the floor, all of which were going to be part of the weekend. I didn’t want to be a bother or a fuss, or spoil it for others. I sent Donna a message explaining my situation and suggesting that maybe I should rather not attend but reschedule for her 2018 retreat. So I went. With some trepidation, but I went. We were all going to share rooms, but my “roomie” unfortunately ended up in hospital and didn’t arrive. I had the luxury of 3 nights alone, which on reflection was just perfect. I was able to wake up in the wee small hours, journal and colour mandalas without fear of disturbing anyone. The owner of the venue kindly put me in a room just off the verandah with easy access to the dining area. What I found interesting is that I didn’t want to engage with anyone. I wasn’t unfriendly. Just quiet and withdrawn. I didn’t have an inclination to join the group chats or even get to know anyone at any great depth. It felt odd because that’s not how I know myself. Even Donna kept asking if I was OK. I began to wonder if I had made a mistake in coming. I felt uncomfortable, out of sorts. This was me receiving. Not wanting to be the one “out there”. Leading discussions, sharing my experiences. Doing doing. I was deeply content to sit back and allow. Having my bag carried while I negotiated pathways with crutches. My empty plate being cleared away. A drink brought to me. Someone putting my crutches safely out of the way in the workshop space and bringing them and my shoes back to me afterwards. Little acts of service I received. We tend to brush away offers of help, not wanting to be a bother. Unwilling to have a fuss made, or to be seen to be needy. As someone who is known as a leader, who takes the initiative, who is the helper and the one who does; this was a new experience to allow myself to receive. It ended up being a profound and transformational weekend in the quietest and simplest of ways. There are times that our shifts don’t come with bells, whistles and trumpets. They slip in and gently nudge our awareness awake. I have stayed in this space of receiving ever since that retreat. I’m learning to ask when I need help, without the guilt. I express my gratefulness and on the whole my interactions with other people have changed. They are kinder and softer. It’s as though as I allow myself to receive, they receive as well. It’s a beautiful space to be in. This entry was tagged Allowing, Fairy Godmother;, receive, retreat, transformation. Bookmark the permalink.